We hear so often that we should support our troops. Unfortunately, the loudest among those who say it seem to be those who want to get our troops into more foreign wars. But is there a way for us to give real support to our troops while still being faithful to our values, specifically, our desire for peace? Yes there is. It's to keep on working for what we believe. To the extent we succeed, fewer of our troops will be put at risk and fewer of them will find themselves in situations where they do things to other people in other countries, things that they will greatly regret. 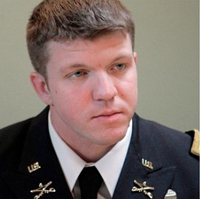 Someone who understands this well is U.S. Army Major Danny Sjursen, a veteran of the Iraq and Afghanistan wars. Major Sjursen, who has become one of our best authors, wants, like you, to get the U.S. out of its aggressive role in other countries' affairs. Please read Major Sjursen's heartfelt letter. Then please donate to keep voices like his in the debate. Now is the perfect time to renew that support. We have matching funds available! Every dollar you pitch in to help us keep broadcasting powerful antiwar messages, like those penned by Major Sjursen, will be doubled. However, securing the best of the best isn't free. Ron Paul asks: Who Won at the Summit? Trump or Kim?